This is the new band of the Italian singer and composer Parris Hyde. The band was formed in 2013 and although it has few years of existence the person behind it has an experience of 30 years. In 2016 the band released their debut album which I am about to present here. By the way the title of the album is in Latin and can be translated as your death, my life (something that describes pretty much the human society, especially these past few years). Musically the band moves on the path of traditional heavy metal which is influenced by the glorious 80’s, without though losing its modern touch. It is an album that has variety and someone can listen from straight heavy metal songs to some more “commercial oriented” ones like the song “I Love Shopping (with your Money)”. The songs lyrically have a grotesque and horror touch without missing though some more serious ones such as the songs “The Third Millennium Disillusion” and “Digital Dreamland”. In my opinion the band has a sound that is close to U.S. metal bands and artists like LIZZY BORDEN, LEATHERWOLF and ALICE COOPER, but you can also find some MERCYFUL FATE touches. 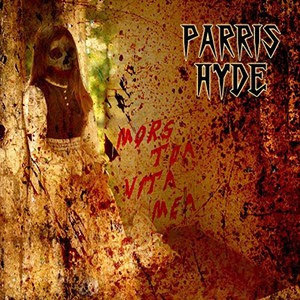 Finally the voice of Parris Hyde reminded me a bit of Tobias Sammet, though he has to improve his pronunciation of the English language. All in all this is a good album for the fans of traditional heavy metal and especially the ones that love the U.S. metal scene. The performances are very good and the songs offer a variety of emotions. The only thing that this album lacks a bit is the sound production which without being bad, could have been even better. Αναρτήθηκε από Nick Parastatidis στις 4:43 μ.μ.